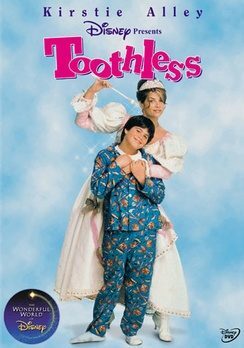 There is one reason and one reason only I would even consider watching a movie like TOOTHLESS and the reason is Kirstie Alley. I’ve been a big fan of hers ever since “Star Trek II: The Wrath of Khan” and “Cheers” In fact, I didn’t start watching “Cheers” until Kirstie Alley joined the cast as I think that Shelly Long is such an unfunny and untalented actress that she makes Tanya Roberts look like Katherine Hepburn. I loved Kirstie Alley in her short lived Showtime series “Fat Actress”. And ever since she burned up the ballroom floor on the 12th Season of “Dancing With The Stars” I’ve become even more enamored with her. Who really knows why I stopped to watch the movie but all I know is that after ten or fifteen minutes I was hooked as I got really curious to see where this story was going to go and how it was going to get there. Dr. Katherine Lewis (Kirstie Alley) is a prominent and successful dentist, following in the footsteps of her father who she worshiped and adored. Katherine’s life should be a rich and happy one, but she has few friends and always feels four or five steps removed from life. Her best friend Mindy (Melanie Mayron) is constantly after her to get out and meet new people, make new friends, you know the drill. But Katherine keeps putting off going after the things she really wants out of life until the fateful day when her life runs out and she’s killed in an accident. Katherine arrives in Limbo, which is a barren, arid desert decorated with surrealistic rock formations. There are a number of Airstream trailers neatly lined up, all with different art deco signs: ‘Training’ ‘Uniforms’ ‘Offices’ ‘The World’ and Katherine is informed by The Gatekeeper (Yeardley Smith) that she is dead and has to wait for her Supervisor who will explain things to her. The Supervisor is no-nonsense, by the book disciplinarian named Rogers (Lynn Redgrave) who was probably Sgt. Hartmann’s mom when she was alive. She informs Katherine that Limbo is a waiting area where newly arrived souls have to perform certain jobs before they can go on to Heaven or Hell. And Rogers has a job that’s uniquely suited to Katherine: The Tooth Fairy. This is where the movie started to get interesting because the story started to remind me of a series of books written by Piers Anthony called ‘Incarnations Of Immortality’ which was about how mortals were given various jobs to perform such as Death, Nature, Time, War and how they fulfilled these functions and some of the best moments in TOOTHLESS are those that show how Katherine is trained to be The Tooth Fairy by Raul (Daryl Mitchell) who is in charge of not only training Katherine in how to do her job but also The Easter Bunny and Cupid among others. Despite his tutelage Katherine never does get the hang of flying or landing (she flies about as well as Ralph Hinkley) but she’s plucky and she sets out to be the best Tooth Fairy she can be. Things get complicated when Katherine gets involved in the lives of Bobby Jameson (Ross Malinger) and his dad Tom (Dale Midikoff). Bobby has recently lost his mother and he desperately needs help in how to cope with school, girls and his increasing absent dad and against her better judgment and The Rules Of Limbo, Katherine begins to give him advice. Of course, being a kid, Bobby tells his friend, who tells two of his friends who tells to of their friends and so on and so on and so on and soon there’s a rash of kids doing everything they can including eating pure sugar and punching each other in the jaw to lose teeth so that The Tooth Fairy can come help them with their problems and it’s not long before Katherine is one overworked fairy. The Office of Bicuspid Procurement is ecstatic because Katherine’s the most successful Tooth Fairy they’ve had in hundreds of years but her constant flaunting of the rules may earn her a one way trip down in The Hellavator which only has one stop and it’s a hot one. The performances in this movie aren’t what I would call Academy Award material but they are energetic and they sell the movie. Kirstie Alley looks as if she’s having a ball, especially in her scenes with Lynn Redgrave where the two of them are trading insults and arguing back and forth. Daryl Mitchell shares a couple of scenes with Kirstie that have honest emotion behind them, especially the one where he painfully explains to her why he can never leave Limbo. Eileen Brennan shows up as the Chief Judge of The Judgment Board. All six members are named Joe and the reason is never explained. In fact, there are a lot of goofy things in Limbo that are never explained, they’re just thrown in as eye or ear candy and I liked that a lot. And for the comic book fans, if you ever do see this movie keep an eye out for Helen Slater (“Supergirl”) who has a supporting role as the mother of the girl Bobby has a crush on. So should you see TOOTHLESS? That depends on the individual. There are some who will read this review who wouldn’t go near a Disney movie if you paid them and openly sneer at anybody who does and that’s a shame. There’s nothing wrong with movies that are made simply to make you feel good after you watch it and that’s the feeling TOOTHLESS left me with. Not every movie made has to be a masterpiece but it does has to be true to it’s story and it’s characters and be made with an honest commitment that the cast and crew believe in what they’re doing and they do it with imagination, humor and professionalism. TOOTHLESS has all of that. Put your cynicism and sophistication in the sock drawer for an hour and a half and I think you’ll enjoy it.